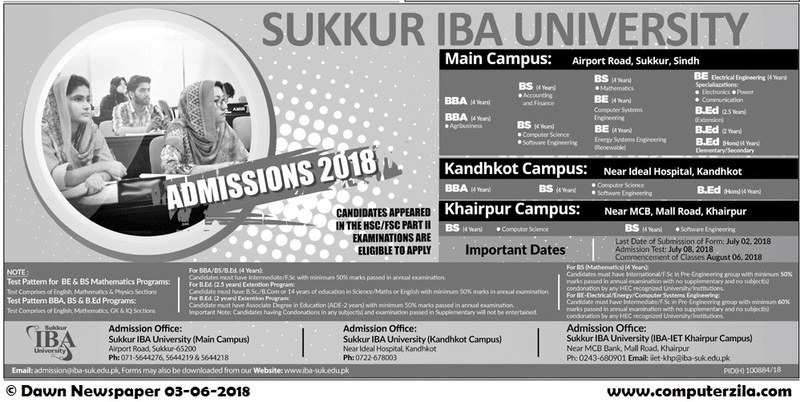 Admissions Open at Sukkur IBA University's Khairpur, Sukkur, and Kandhkot Campus for the batch Fall 2018. IBA offers admissions in different fields of study for Bachelors. you can apply for BE - Bachelor of Engineering, BS - Bachelor of Science, B.Ed. - Bachelor of Education, and BBA - Bachelor of Business Administration, , . Sukkur (Institute of Business Administration) IBA University offers admissions in Bachelor's degree program in the following Fields. Candidate's must have intermediate / F.Sc with minimum 50% marks passed in annual examination.